Weekly photo challenge: Wonder | Welcome to allaboutwordswa! 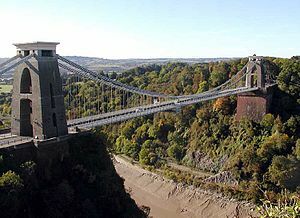 In 2008 I visited the Clifton Suspension Bridge that spans the picturesque Avon Gorge. It is the symbol of the city of Bristol in the UK. Its story began in 1754 with the dream of a Bristol merchant who left a legacy to build a bridge over the Gorge. A 24-year-old Isambard Kingdom Brunel was appointed engineer. I found it hard to believe that it was around 150 years old. It looked like new – bright and shiny and beautifully built. If you click on the photo below it will be easier to read the text. I think it is among the most amazing “man-made” wonders in the world. ← When is it a good time to quit? Nice bridge. I like the beautiful shape. Beautiful bridge, especially that one view from above (in the link). I love the towers. Thanks for your comments Elizabeth. I hope you have a happy week ahead of you!